Replaced the zip on a 3ft long tent bag! We up cycled cutlery and made four coat hangers. All of these were sold for a donation. help as a volunteer repairer. Fix, reuse, repair don't throw away! hoovers. Toys, fix broken wheels, lost screws. What a sight! A thing of beauty. I took this photo today at the wild life garden. 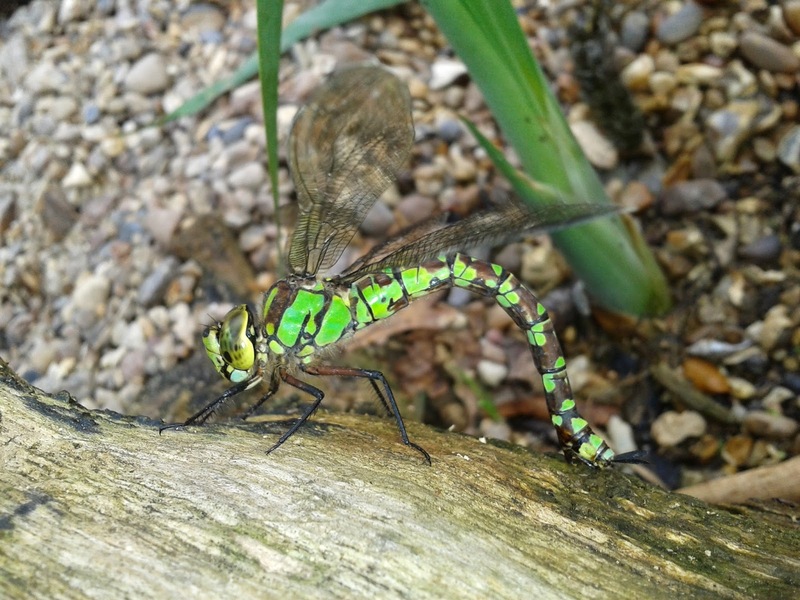 My 3yr old son Danny was amazed at this dancing fairy like creature as it laid its eggs on the edges of the Wivenhoe wild life pond. And thank you to everyone who has been involved in the creation of this special place and made it possible for my son to enjoy this moment with his dad. We're keen to exploit adult help too on the community allotment, so if you fancy learning how to grow organic veg we have an open session first Sunday every month 2pm to 4pm - if you like it then come more often. Easy. Get in touch if you want to find out more or need directions. Plot no. 1 at the Wiv allotment site. 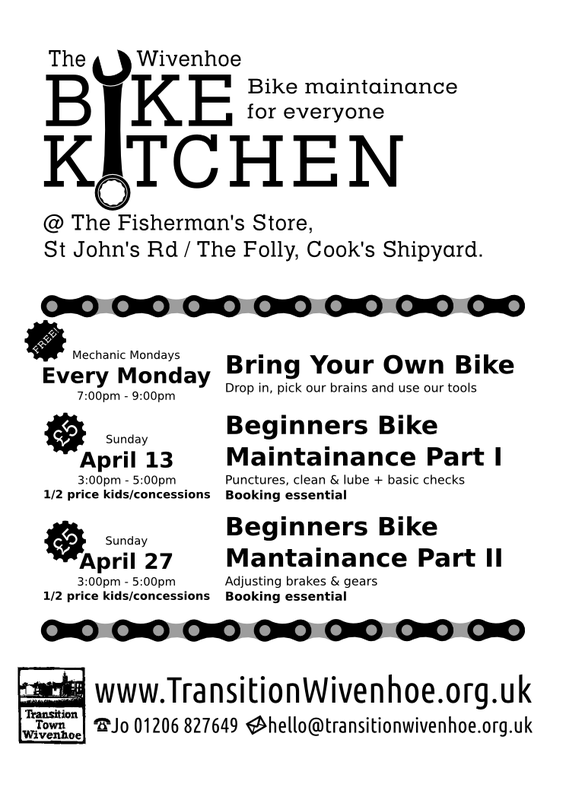 Come and learn how to look after your bike - brakes, gears, punctures, cleaning & oiling... all the basics. Sunday 13th or 27th July, 2pm to 5pm. 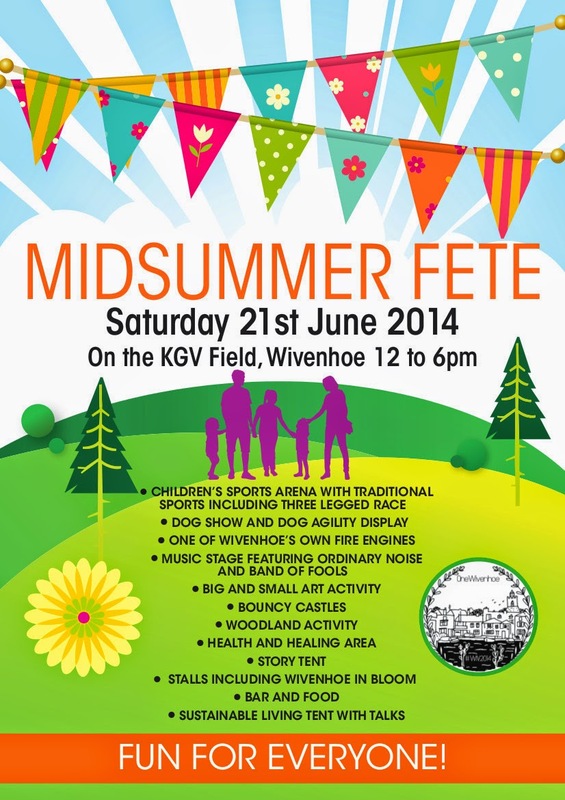 Wild About Wivenhoe GRAND LAUNCH!!! Wildlife/Jubilee Garden, nr the Scout & Guide Hall, High St.
bring your own chair and torch! Wild About Wivenhoe is a partnership between Wivenhoe Watching Wildlife, Transition Town Wivenhoe, Wivenhoe Town Council and Wivenhoe Library. Obviously I'm pretty dissapointed that Harrison Ford has forgotten his hat, but otherwise Years of Living Dangerously (US TV meets climate change) is surprisingly good. Also just surprising. I'm feeling pretty lucky that Wivenhoe has escaped effects from climate change so far... It seems others haven't been so fortunate. The future has arrived. From here on all blog posts should automatically be posted to Twitter and Facebook. 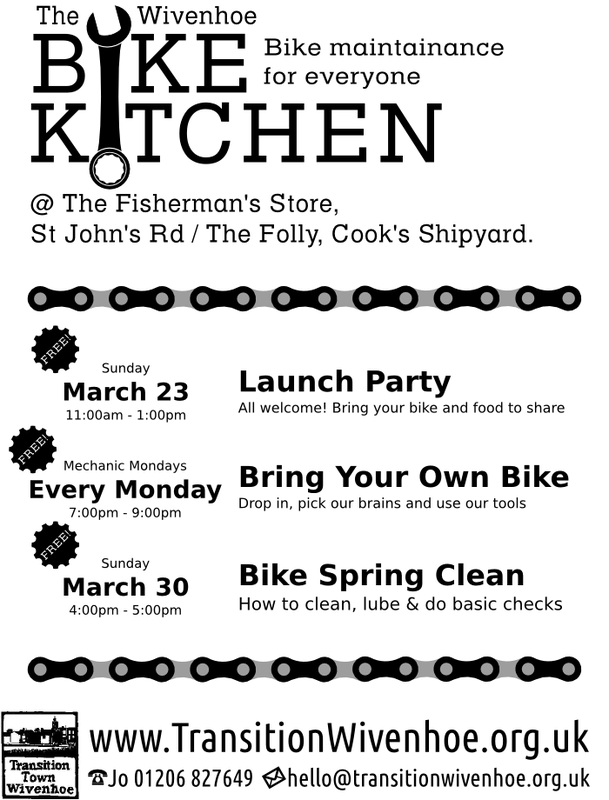 The first Mechanic Monday at the new Bike Kitchen was marvellous! Several people dropped in to work on their bikes - Jay patiently showed how to oil a chain properly, realign a wonky mud guard, adjust gears so they run smoothly, and a couple of people even got to true their wheels! We're running sessions every Monday 7 to 9pm. 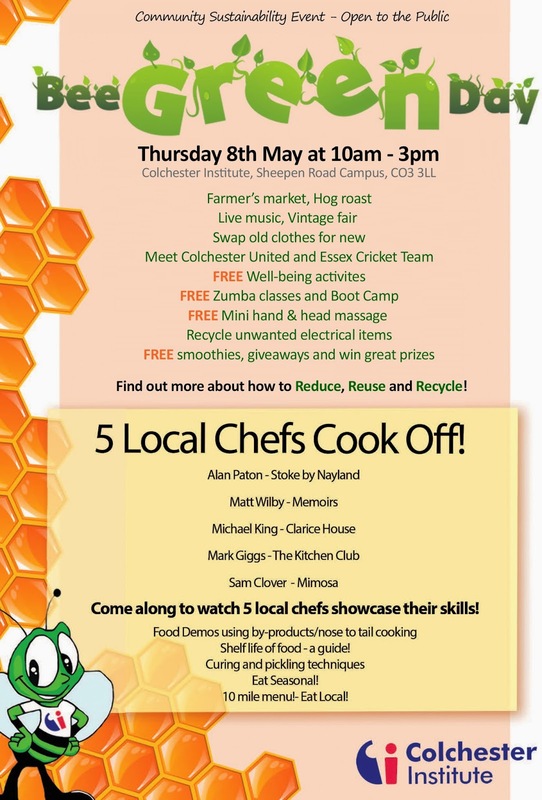 It's free, but donations will help with running costs. It's just off St John's Rd, next to the new canoe racks. We will be doing a bit of spring cleaning in the wildlife garden on Sunday 6th April from 10am till 13:30. It is a good chance to get out and enjoy the garden with friends while we make sure it looks amazing for the up-coming Wild About Wivenhoe events at the end of April. The pond is becoming established and is full of newly hatched tadpoles. So bring the kids down to have a look at them. If anyone has some pond weed that they can add to the pond that would really help, but remember to wash them first to remove any duckweed! When did that happen - it's March all of a sudden! With the sleep still in their eyes, Team Transition Wivenhoe peeks out of their hibernation cave and notices that it's time to sow the first seeds at the allotment. Get to it! Linda clears a bed, ready for something new. You can come and help Transition Wivenhoe (and have a share of any harvest) on Plot #1 at the Wiv Allotments on the first Sunday of the month between 2pm and 4pm. Email for details.